For years, CS:GO players have bought and sold virtual weapon skins in Steam’s marketplace. They’re cosmetic finishes players can paste on top of guns. As time went on, rarer skins’ market valuations would surpass the thousand-dollar mark. That’s when some savvy gamers had the idea to build websites that let users gamble using CS:GO skins instead of money. In July 2016, news broke that two CS:GO YouTubers who’d regularly brag of their impressive earnings off CSGOLotto.com in fact owned the site—and had not disclosed that in their videos in which they encouraged their fans to start gambling. 23 skin-gambling sites received cease and desist letters shortly thereafter. Exposed for its gray-area legality (even in places where it might have been legal for adults, there was nothing to stop kids from using it, and they did), the CS:GO skin gambling industry momentarily buckled under pressure from Valve, publisher of CS:GO and the company behind Steam. But the $2.3 billion industry built on its back didn’t evaporate, though; it disseminated. 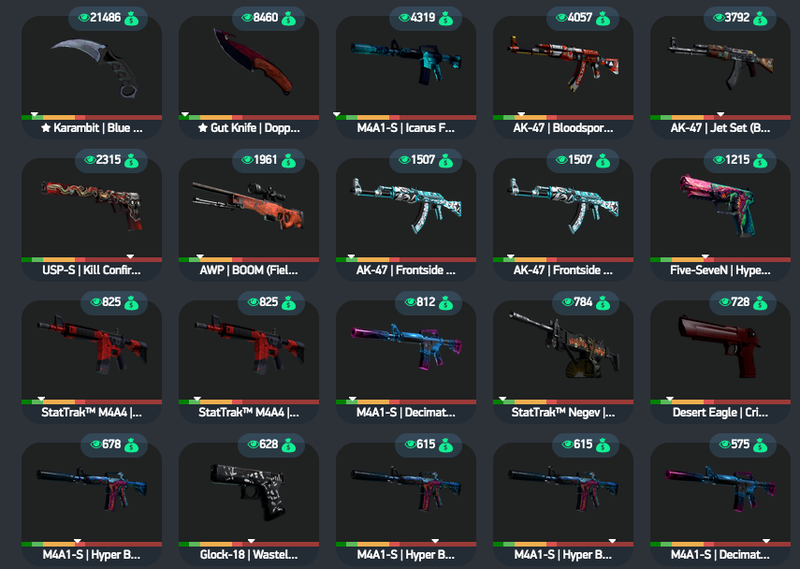 Now, dozens of sites are offering free Counter-Strike skins in exchange for doing online tasks—anything from watching an endless stream of ads to completing the trial of a dumb mobile game to buying twelve chocolate strawberries. A few months ago, I was queued up for a Rocket League match when the game pitted me against a strange opponent. Hovering above their car where a username would have been was a scramble of letters and numbers. Somewhere in this jumble, I could make out a URL: collectskins.com. Lots of gamers use their tags to express themselves, to assert some sense of identity and ownership over their avatar; and here’s this guy just shilling for a Counter-Strike site. What gives? Curious about what made Collectskins.com compelling enough to advertise, I entered the URL into Chrome. After clicking around a little, I found what I was looking for on a tab reading Free Skins: Players could receive more points toward CS:GO skins for adding “collectskins.com” to their Steam nicknames. But that was the tiniest fraction of the site’s business model. Scrolling down the side of the page was a live feed, and every few seconds, it updated with something like this: “|Neo Trox| ^^ CollectSkins.com Earned 0.56 on AdscendMedia,” “PDFlow CollectSkins.com earned 0.58 on AdscendMedia.” These were some of the hundreds of thousands of users, like my friend in Rocket League, who were grinding away their time earning credits toward Counter-Strike skins. “If you tell people you can get free Counter-Strike skins, I think they’d respond that ‘Nothing in the world is free,’” Jacob, who owns Collectskins.com, told me. Jacob is a 21-year-old college economics student in Denmark who, last year, learned of the bustling online industry of “Get Paid To” or “GPT” sites. You’ve probably seen banners for them online at one time or another: “Get paid to complete surveys” and the like. Traditionally, users perform a startlingly broad array of online tasks and are paid out small sums in their PayPal accounts. Collectskins.com works like that, but instead of money, users get points toward CS:GO skins. Once users earn points, they can obtain skins from Jacob’s stock, which he purchases from third-party CS:GO skin sites that buy the skins off users at a price-point cheaper than Steam’s official marketplace. Jacob says his site attracts about 35,000 active users a month. Chris, another college student who owns another “free” CS:GO skins site called Earn.gg, attracts 120,000 active users a month. He moves 1,000 Counter-Strike skins a day and says the site brings in $120,000 a month. Over the last year, free CS:GO skins sites earned the attention of ad networks like Adscend Media, which connects sites to revenue streams. A representative from Adscend reached for comment by Kotaku estimated that she works with a couple dozen free CS:GO skins sites. Over the last year, she said, the industry has ballooned. Collectskins.com and much of its kin are reactions to the CS:GO gambling crackdown. Jacob, who used to gamble for CS:GO skins, didn’t like how opaque the process was, not to mention the questionable legality. Now, he says, he can offer users stable, reliable skin gains in exchange for internet tasks—anything from completing the tutorial for a mobile game to filling out some consumer surveys for big brands. At Earn.gg, one of the site’s developers had close ties with the gambling scene, but jumped ship after Valve sent out cease-and-desist letters in July 2016. “They chose the free CS:GO scene since it was something they were familiar with, at least audience-wise,” said Earn.gg owner Chris. The decreased chances of getting sued were a big bonus, too, Chris told me, adding that although it’s less lucrative than skin-gambling, it comes with less risk and more stability.